since i had the miniatures, i needed somewhere to put them. I was tired of mapping every dungeon in Tiled and printing it. 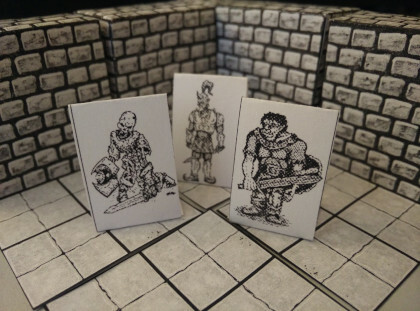 So i decided to make a modular Print and Fold Dungeon Tileset. 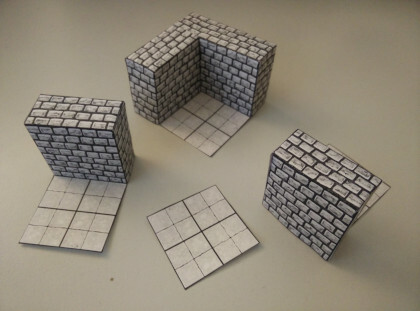 In this first Version you'll find a normal wall, corner wall and a base tile. Just print it, cut it, fold it at the Black lines(except the ones on the floor) and glue the wings. Last edited by Elouin on Mon Jan 07, 2019 9:48 am, edited 3 times in total. Nice stuff! Thanks for doing this. Thanks! Even though i'm not the best at working with office Software and i never done or even used anything like this, i really enjoy making those. Update: Splitted the kinds of pieces into separate Files and added a piece for a "inverse" Corner. Also the floor is now one page floor so you can cut it as you need it. Love it! Simple enough for even me, the artistically challenged, to do. Recommendations on paper type? I've built model rockets using 110# paper; I'd recommend it for this. 50# is good but not heavy enough for me.